I am so freaking excited to welcome you to the first episode of Soul CEO! It’s been such an incredible journey, watching my vision come to life from my mastermind to this podcast. And I know it’s going to be equally amazing to watch your journey and growth as the podcast progresses! On today’s show, I tell a little bit about me and my background and how I came to be a Life & Business Coach. From accounting to building a quarter-million-dollar business in 18 months, I’ve had a wild ride of ups and downs and a whole lot of experience that I’ll be sharing with you all. To be clear, this podcast is not just about business, although I will be giving you tons of great tips that can help you in whatever work you do in the world, whether that’s as an entrepreneur or employee. This show is about what it takes to have it all. It’s about how to see that anything is possible and how to achieve your wildest dreams in every area of your life! 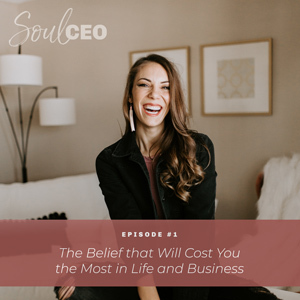 The topic I’m beginning with today is the foundation of everything I teach my clients about how to be the CEO of their soul… it’s the belief that will cost you the most in your life and business. Join me today as I let you in on the not-so-secret source of all of your success and why you must turn inward to find it. If you loved today’s episode and you’re as pumped as I am, please share this podcast with a friend or someone you really care about so that they can embark on this journey and doing this soul work with you to become the CEO of your life, your business, and your relationships! My background and inspiration for creating the SoulCEO podcast. What a Life & Business Coach is and why it’s important to work with someone who is both! Who this podcast is for… and why it’s you. The belief that will cost you the most in your life and business. The most valuable asset you have. Don’t forget to grab your free training of my High-Vibe Formula (how I created a multiple six-figure business, attracted the man of my dreams and created a life with complete time freedom…in less than 18 months)! Hello, how are you guys? Oh my gosh – I am so freaking excited. Today is the day my vision is coming to life. And what’s so cool is Soul CEO actually started as my mastermind, which I adore. It is like my soul project – my soul-work – into a program. And to watch it unfold and turn into this podcast and into this brand, it is kind of surreal. I’m so excited to watch this podcast take life and watch you guys grow and make major transformations in your life. It’s going to be such a fun journey and I’m so beyond grateful for how my path has unfolded to this very moment. I actually just got back from California and what’s so cool is I actually went for Lori Harder’s Bliss Project. It’s like a weekend conference for personal-growth and just stepping into your power. And she is actually the first podcast I ever started listening to. We extended the trip because we were in California, so we had to make a trip to San Diego; my boyfriend and I, when I say we. And what’s so cool is that the Monday I get back, I am recording and getting ready to launch my very own podcast when she was the first podcast I ever listened to and felt inspired by and just absolutely loved. I don’t believe in just luck or irony; I believe it’s the universe’s way of putting everything in my favor and supporting me to do my work in the world and I think it’s just so cool and really a miracle that this is how it all happened. So I’m so excited to be here. I’m so grateful you’re listening. I mean, think about it – whoever’s listening right now, you are the OG Soul CEO podcast listeners and I am so beyond grateful for you because this podcast is about you. This is about my soul-work and giving you everything that I possibly can to help you create the life and business of your dreams – and you are here from day one. So I want to thank you and I want to honor you for that. I cannot wait to get into today’s topic, but first, I want to give you guys a little background on myself. I’m originally from the suburb of Chicago called Naperville and I actually live right outside of Louisville, Kentucky. I played Volleyball at the University of Louisville, which is how I got here and I’ve lived here for quite some time now. I studied accounting in school, which I think is so funny to share with people. Not that there’s anything bad about it; I just think that typically people have a perception of what an accountant’s personality is like and they are a little surprised when I tell them that. But to be honest, I studied accounting because I really didn’t know what I wanted to do with my life. And when I graduated and Volleyball was over, I started a career and I realized over time that it really wasn’t my soul-work and what I was passionate about. So just to make a long story short because I just want to make this a brief introduction – and if you follow me on social media, I talk about my story a lot – but I basically bounced around between five or six corporate jobs before I really got to this point. And for those of you who don’t know, I am a life and business coach. I’m actually going to explain why I’m both and the importance of both in today’s episode. But I bounced around and I always like to tell people that because I feel like we get so stuck in, like, how am I going to figure out what I want to do with my life? How am I going to figure out what direction I want to take? The only reason I got to this point, to find my passion and what I was meant to do was because I kept figuring out what I wanted to do next. I kept taking that next step. So it doesn’t matter where you are on that journey, whether you guys have a business or whether you don’t. This work is really going to be about the soul-work and I feel like when you do that work and things start to fall into alignment and when you start shedding – whether it’s a job, whether it’s a relationship, whatever it is – when you start shedding that stuff over time, it helps lead you to your path. And my path started in a fitness business and then hiring my own life coach to help bring my life and vision and mindset to the next level and turn into this fire inside of me, that I just can’t contain, to share this mindset work and to share my journey and share my business knowledge with the world because I wake up every day loving what I do and loving the life that I’ve created. And it all comes back to my desire to just search for something more. I just knew something more was out there. So I hired a coach and four months later, I realized this was my passion. I launched a business and built it over six months while I worked a corporate job. And then I was able to leave my corporate job. I had built my business up enough over that six months to leave that corporate job. I’ll tell you guys, I’m a self-supporting lady. I had my own house. I had all the things. So I left that job as I built my business. And then, over the course of 18 months from that start date of my business – not when I left my job – I built it into an over quarter-million-dollar business. And that’s just the start for me. And just to see the ripple effect of the work that I’m doing in the world has me so on fire and so excited and so passionate about bringing this work to all of you. So that’s a little bit about my story and I’m sure I’m going to share a ton of it over the course of these podcasts. But I have worked with so many women, I have done so much work in my own life and on my own mindset and I am a human being, just like you guys. I have fears, I have struggles, I have challenges. I’m going to share all of that here. And I find that the best coaches are the coaches who do their own work; the coaches who master their mindset and skill set from the work that they do on their own lives. That is what has made me so skilled at being a coach because I get the fear. I get where we get stuck. I totally am living in that all the time and I’m still able to live the life of my dreams. I’m still able to coach my clients because I see you, I get you, I can meet you where you are and I coach form a place of mastery. And again, this is called the Soul CEO, but I want you guys to know that this isn’t just about business. In fact, most of it is going to be about mindset and life because I believe who we are in life is who we are in business. And when I say business, that could be a job, that could be a passion, that could be whatever work you do in the world. And so we’re going to start, we’re going to work, on our mindset. We’re going to start with that soul-work because I believe that in order to be successful in business – and again, whether you have a business or not – in order to find that business you have to do the souk-work first. It all starts with the mindset. So again, if you don’t have a business, this podcast is still for you. If you just want more for your life and want to live the most amazing life that you could possibly envision, this podcast is for you. I’m going to give you all the mindset tools that you need in order to show up to your life, relationships, business, job, whatever it is, at an entirely new level. So it starts with your mindset. It starts with the soul-work. And in the process, if you find something that you are extremely passionate about and want to turn that into a business, we will get there and you will be able to use this work at every single level. I used this work, this mindset work, at every single level. So that’s why I created this and this is why I coach the way I do and this is why I created this mastermind. Business is fun to talk about. I have so many things to teach in that, but it all starts with the mindset. So this actually leads me into today’s topic, which is so funny. I actually didn’t even work it out that way, but what I’m going to talk about today is the belief that will cost you the most in your life and business. And again, when I say business, it could be as an employee, it could be anything. It could be working your passion or it could be having a side-business. It doesn’t really matter. And what I find is, people typically want the fast-track to success. They want the equation. They want to know the marketing techniques or the tools or the quick-fix to their problems or the quick diet change, or whatever it is. And this comes from a belief that the answer is outside of yourself; that the answer can come from someone else or something else or a plan or tool that is going to give you a quick fix. And what I will tell you, in order to make long-lasting change, you have to start within. You have to start with your soul because while all of that stuff can help, I see in my job as a life in business coach to give my clients – and all of you, you’re kind of like my clients. You’re listening to my podcast. I’m going to be teaching you everything that I possibly can here – I see it as my job to teach them everything that they need in order to self-evaluate, in order to grow to every single level, whether they have me as a coach or not. Now, I’m not saying that stuff isn’t important. In business, there is a math-piece to being successful, or like in general, whether it’s a fitness journey or whether it’s a relationship journey. Whatever it is, there’s a math-piece to it. There are certain systems you can put in place. When I say math, I mean like systems that will help you reach your goals. But there is always a mindset piece and we can change a lot by mindset. If you have the right math but the wrong mindset, it’s not going to matter. It all starts with the mindset. That is at the foundation of everything. And so, what I find is a lot of people are going to come to this podcast – a lot of people come to me as a coach and they want answers. They want me to tell them what to do. They want me to tell them which route to take. They want me to tell them what program they should do or what diet or what – whatever it is, they want to know the answer. And the thing is I am not here to give you that. And while I will share my business knowledge and my experience because I believe it’s my job as a coach to try stuff and fail and give my clients and you the opportunity to learn from my failures so that you can move faster in your transformation. I will always start with you and your mindset and your beliefs and the thoughts that you have behind the work that you’re doing because our current life, our current reality, is a result of our mindset and our belief systems and the actions that we take. And that all comes from the thoughts that we have and the way we show up to things. So, I will tell you that this work, this Soul CEO podcast, is going to be about that soul-work. It’s going to be about that mindset-work because if you are the answer – if your mindset and your decision-making process is going to dictate your results then that’s what we have to work on because once you’re getting the results you desire, that means your mindset and your decision-making process is aligned with that. So if you think you’re going to show up here and I’m going to give you all the answers – I’m going to tell you what to do, I’m going to tell you how to post on Facebook, I’m going to tell you how I did this. While that all will be a piece of this work and a piece of this podcast and things I am going to share, I want you to lean into the fact that your journey might look very different than mine; that what works for you is going to look different than mine. And that is ultimately what will dictate your results because at any given moment, if you believe you have the answers within, that you have the tools, that you have the mindset and that you show up to every failure and every misstep of your journey then you will always have the power to make changes and try new things and try something different. So your mindset is at the heart of your life and of your results and of your business. It’s not separate and how you do one thing is how you do everything and that all starts with your mindset. So the belief that will cost you the most in your life and your business is that an external factor is going to dictate your results, or an external tip or tool or trick or fast, you know, method is going to be what gives you the results you have mistaken. And that’s totally okay because I do that now even, at my level in business and in life, with my mindset, with coaching consistently and having my own coach. Sometimes I think that the answer has to be having a better marketing plan. And again, while that stuff is important and it plays a huge role, I know that it starts with my mindset, and I know that it starts with that inner-work. And so that is what this podcast is about. It’s about that inner-soul-work and that will translate into business. And you will get tips and tricks and tools, I promise, but I want you guys to all lean into the fact that your belief systems, your mindsets, the things you think and the actions that you take as a result of that are the most valuable asset that you have. I’m going to repeat that; your mindset is the most valuable asset that you have because it will dictate how you show up to every single decision, how you show up to every single circumstance, every single relationship, every single business decision or business approach that you take. It dictates everything. So if you believe that you’re going to come here and you’re going to get a quick fix and you’re going to get answers, I will tell you, turn inward. The answers start with you. And that’s what Soul CEO is about. And that’s what I teach my Soul CEOs and my mastermind and that’s what I teach my clients first and foremost; it starts with you. I promise, we’re going to have fun. We’re going to get into the business side. I’m going to give you things that work in that regard and give you access to knowledge from my growth and my transformation, but I always want to make sure that I’m giving you the tools to show up to your life all the time the way that you want to with the mindset that you need in order to create the results that you want. So I’m so freaking excited you guys are here. Thank you so much for listening to the first episode of this podcast and I cannot wait to talk to you every single week and share my knowledge with you and watch your transformation. So if you loved this episode and you’re as pumped as I am, I would love for you to share this with a friend. I would love for you to share this with someone that is important to you or that you really care about so that they can embark on this journey with you on doing this inner work, on ding this soul work, so you can become the CEO of your life, your business, if that’s what you want, your relationships; every single thing in your life. And I am so freaking excited that you’re here, so thank you so much and I cannot wait to talk to you again next time.